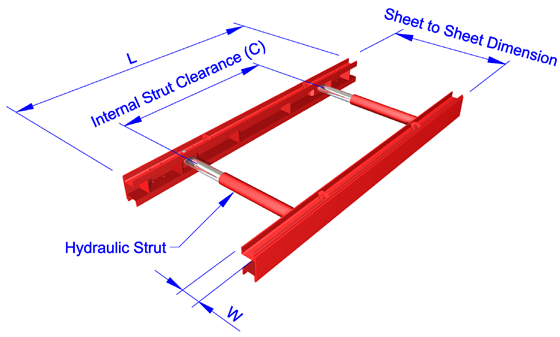 Hydraulic bracing systems are designed to operate in conjunction with trench sheets or sheet piles. 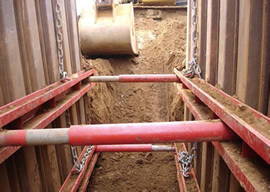 These systems satisfy the many permutations for two sided trench and four sided manhole, chamber or small cofferdam type excavations that are typically encountered in groundwork, utility and other general industry applications. Simple Pin and Clip connections enable rapid assembly and installation and precise adjustment of dimensions can be achieved via integral hydraulic rams. Site safety is assured by utilising our range of compatible safety products and ancillary tools.